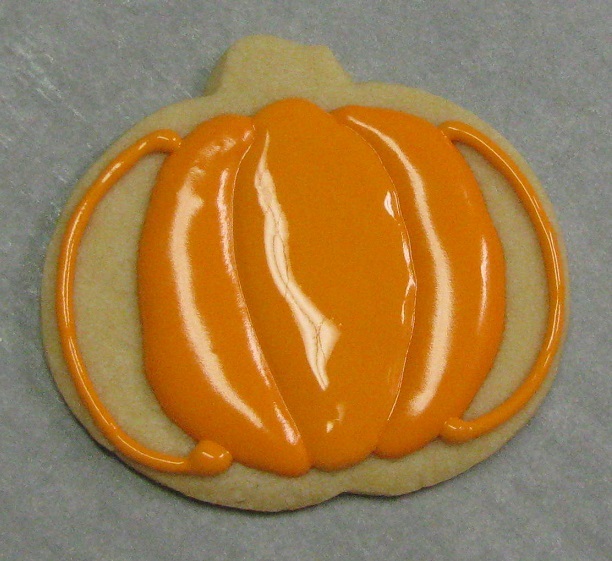 Learn how to make these beautiful pumpkin cookies. Perfect for any fall celebration! regular spatula will do), and a rolling pin. 5) Royal Icing for Flooding. (Recipe located in "Frosting, Icing, and Fondant" recipe section). Begin by placing one sheet of wax paper down on your countertop. Grab a handful of cookie dough (about a softball size amount) and form into a ball. 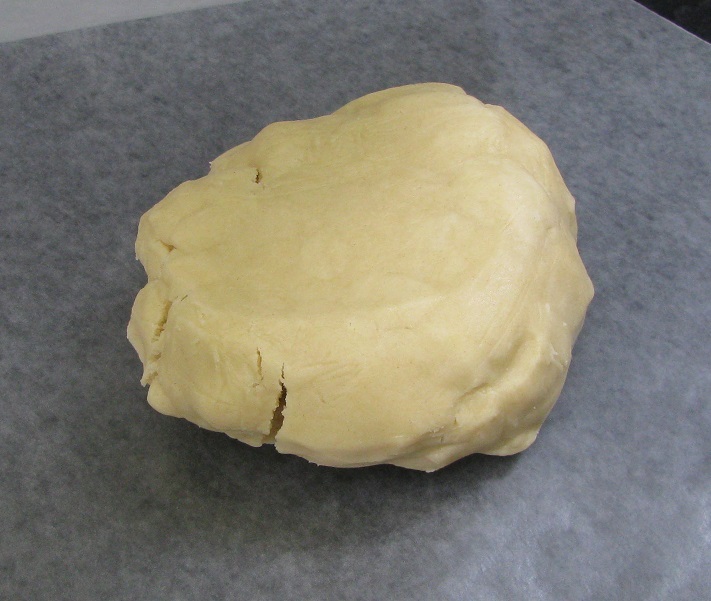 Place ball of dough on the sheet of wax paper and with the palm of your hand press down to create a flat top. This will help with rolling the dough into a flat round shape. Place second sheet of wax paper over the cookie dough. Roll dough to about 1/4 of an inch thick. 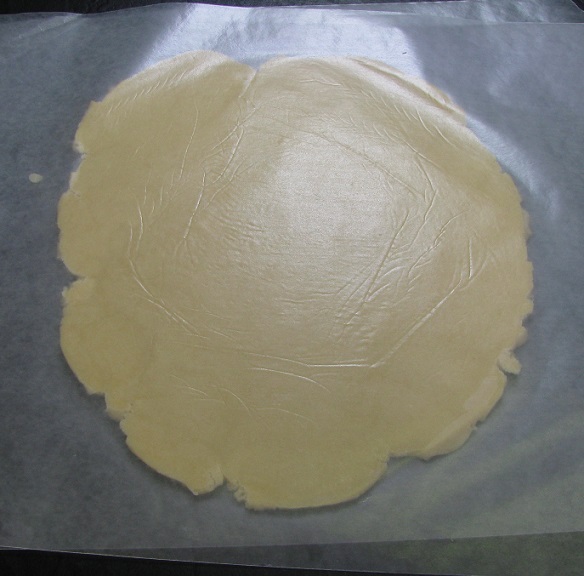 Peel top layer of wax paper back and sprinkle a small amount of all purpose flour over dough. With your fingertips, gently smear the flour over the surface of the dough until only a small amount remains on top of dough. The excess will fall off to the side. Beginning as close to the edge as possible, cut out as many pumpkins as you can. Sometimes it doesn't go as perfectly as you'd like :). If only that empty space was a tad bit larger! Use your spatula to slide underneath the dough to remove the leftover pieces from the wax paper. Set aside for rerolling. Sometimes bits of dough stick to the sides of the cookies, but to get perfect cookies they must be removed. Take the thin edge of the offset angled spatula (or use a knife) and line it up with the edge of the cookie. Press down to cut. 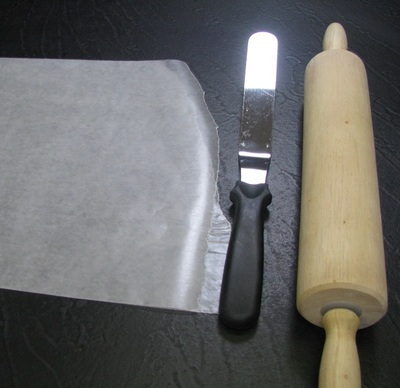 Keeping the spatula's edge (or knife) pressed against the wax paper, sweep away the scraps. To scoop cookies, use your finger tips to hold the edge of the wax paper in place. Starting on the side of the cookie that is nearest to your finger tips, slide the spatula under the cookie in the direction that is away from your finger tips to separate the cookie from the wax paper. 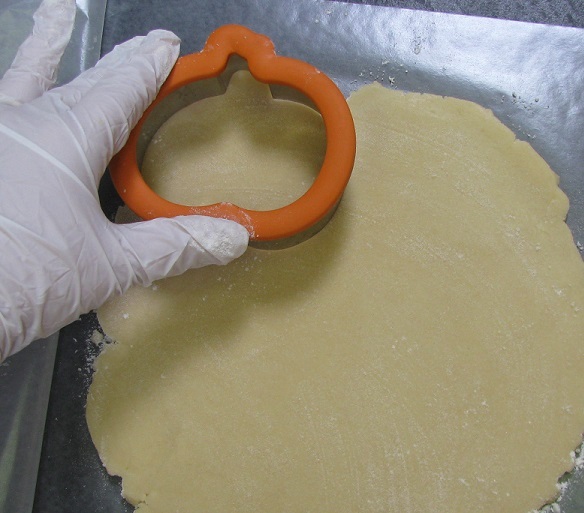 Use a gentle, short back and forth sawing motion to loosen the cookie to prevent tearing or distorting. Line a baking sheet with parchment paper and place cookies on the paper. Now they're ready for baking! Bake according to the instructions for the recipe you're using. Bake until cookies are golden around the edges (If using a light colored dough). Allow to cool completely. Assemble pastry bag with the coupler and Wilton #3 tip. Reserve enough "Royal Icing for Flooding" to decorate pumpkin stems and greenery and set aside (in covered bowl or sealed baggie). 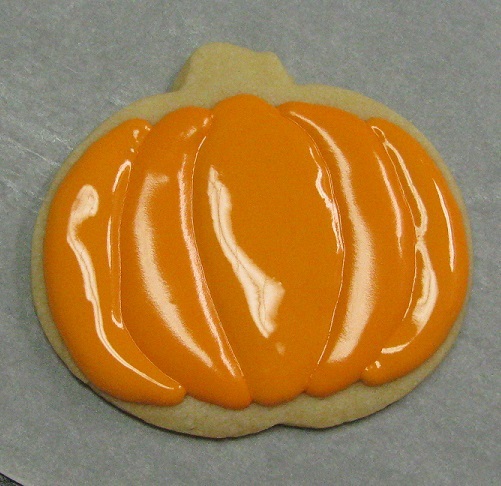 Add Wilton orange gel color to royal icing and stir to mix color evenly. If needed, add more color a little at a time, stirring well after each addition, until a good pumpkin color is reached. plan ahead 4 or more hours (or even the day before) and color a few small sample amounts of icing in different hues. Using a plate, paper towel or wax paper, dab a small amount from each hue and allow to dry for several hours. Keep unused wet portion of each sample hue covered so the large batch used for decorating can be easily dyed to match. To fill pastry bag, hold the bag decorating tip down and fold the top edges over like a cuff. Pastry bag can be held or set inside a cup to hold it up. Fill bag with orange icing. 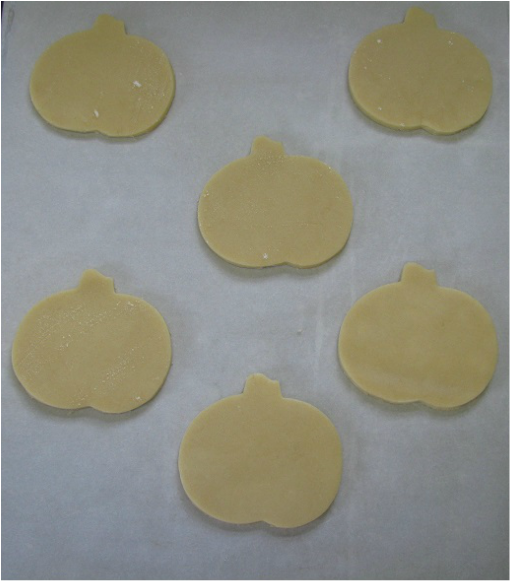 Mentally divide the pumpkin cookie into 5 sections that resemble a pumpkin's natural ripple texture. I'll refer to these sections as "part #1, part #2... etc". 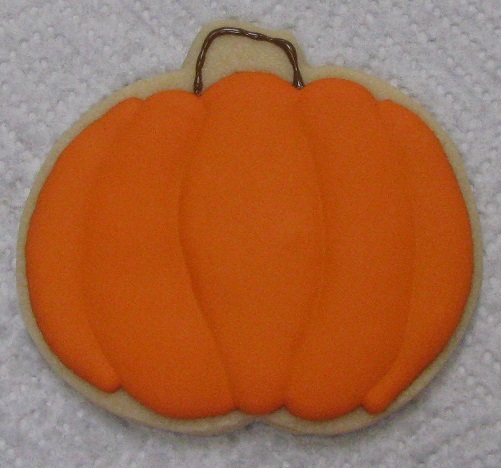 Using the pastry bag fitted with the Wilton #3 tip and filled with orange royal icing, outline the imagined "part #2" of the pumpkin cookie. 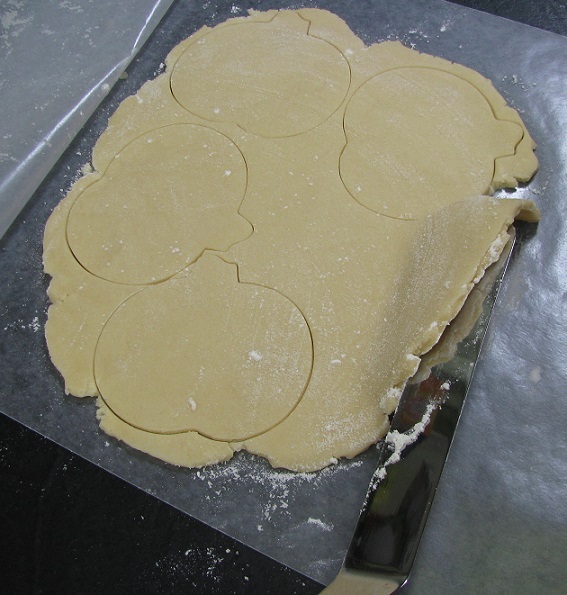 To do this, gently rest the pastry bag tip directly on the cookie where you want to begin the outline. 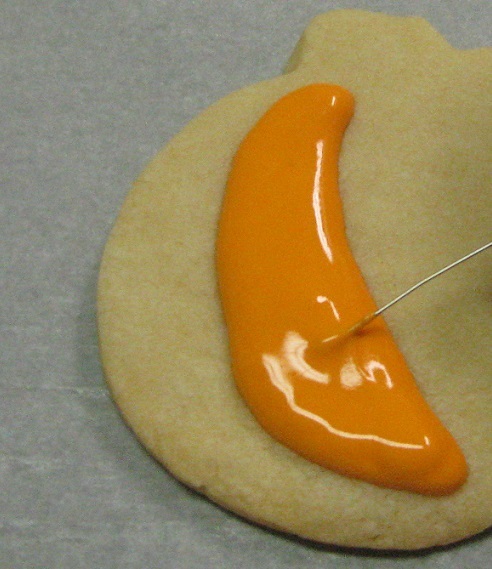 Gently squeeze a small dab of icing onto the cookie (this will allow the icing to stick to the cookie). 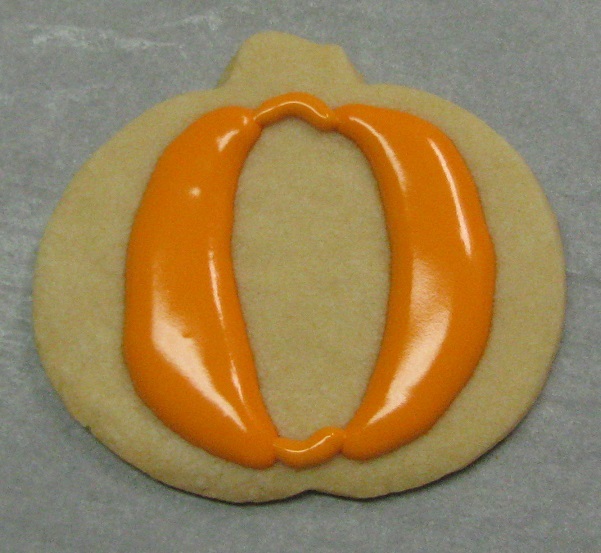 While continuing to gently squeeze, lift the icing tip off of the cookie about 1/2" to 2" in height and finish outlining the imagined #2 section. 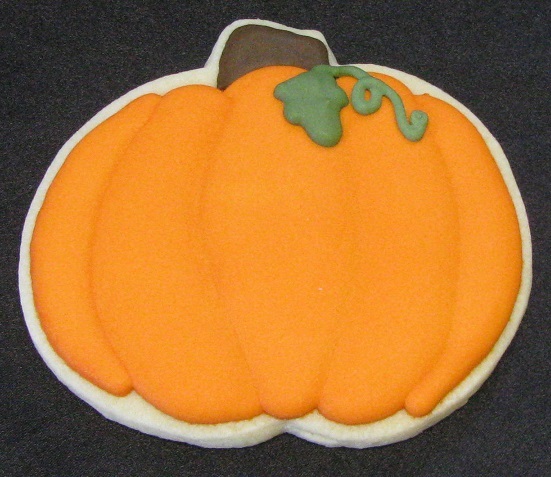 (Lifting the icing tip off of the cookie ensures a straighter smoother line.) 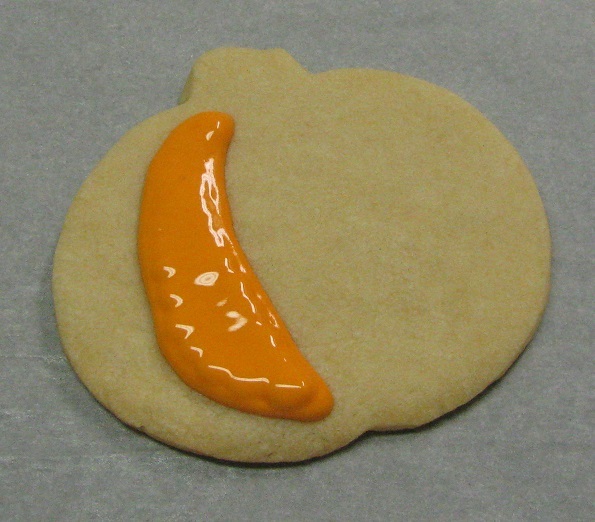 When outline is complete, without squeezing, gently dab the pastry bag tip onto the cookie where the outline began to close the outline to finish piping. Continuing to use the pastry bag fitted with the #3 tip, fill in the outlined section by beginning at the top of the outlined area, keeping the pastry tip very close to the cookie's surface and gently squeezing pastry bag, moving in a back and forth zig-zag pattern until outline is completely filled. Using a long pin or the tip of a pointed knife, gently swirl icing to remove air bubbles and smooth the icing. Continue piping imagined "part #4" using the same method as used for part #2. Allow surface of icing to dry for at least 1 hour before continuing. In the mean time decorate remaining cookies with parts #2 and #4. As surface of the icing begins to dry it will become less glossy. Icing will not be completely dry at this point, so try to avoid touching it. Now we're ready to move on to part #3. Pipe a small curved outline on the top and bottom of part #3 to connect parts #2 and #4, enclosing the area. 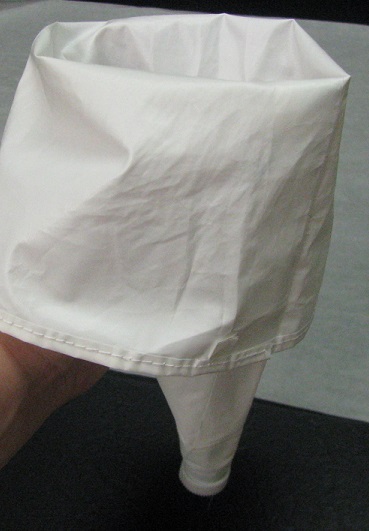 Continuing with the pastry bag with the #3 tip, pipe along the inside edge of part #3. 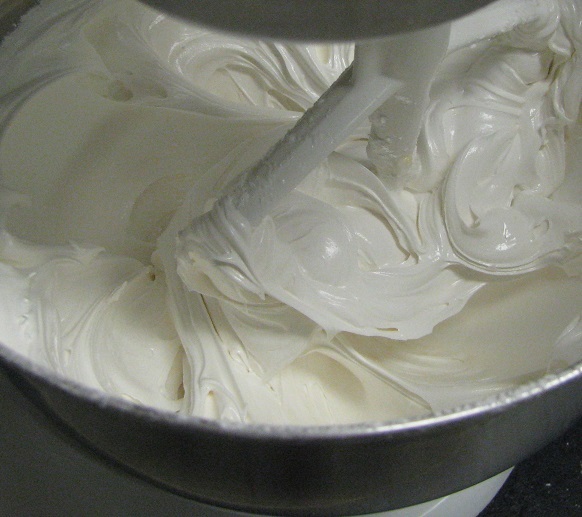 Fill in part #3 and swirl icing with a long pin or pointed knife to remove air bubbles and smooth icing. Next, outline parts #1 and #5. Fill in parts #1 and #5 with the royal icing and swirl with a long pin or a pointed knife. Next, color your royal icing reserved for the stems brown using Wilton brown gel color. 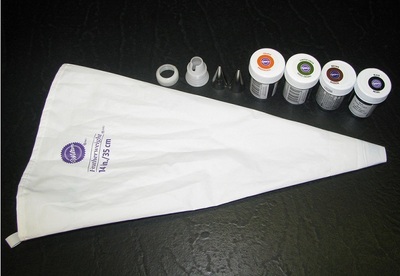 Clean your pastry bag well (or just use a new one) and fit it with the Wilton #2 decorating tip. Outline the pumpkin's stem. 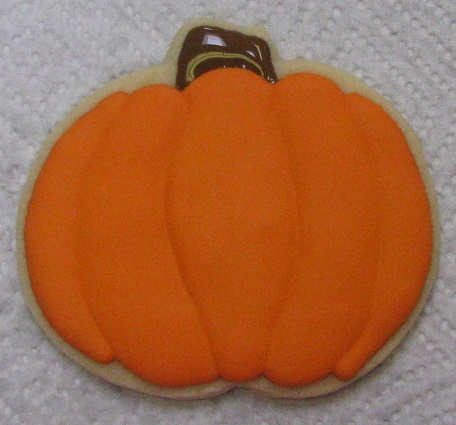 Fill in the pumpkin's stem with the brown royal icing, swirl with pin or pointed knife, and let dry for at least an hour. 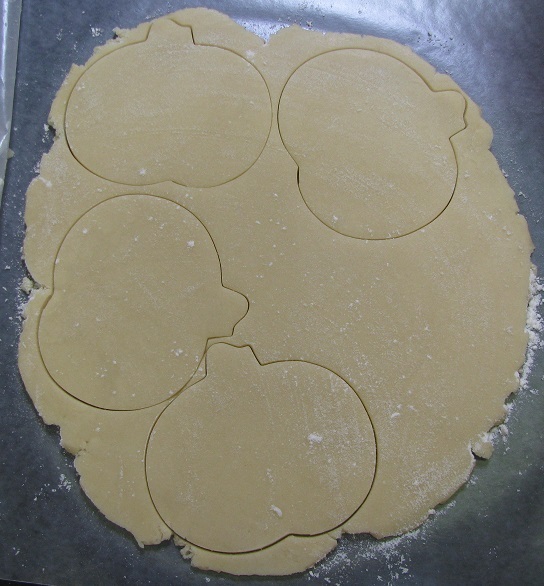 Meanwhile, outline and fill the stems of the remaining pumpkin cookies. ﻿Now, color your royal icing reserved for the pumpkin's greenery and color with Wilton gel color in Juniper Green. Using a pastry bag fitted with the #2 Wilton decorating tip, pipe a leaf and swirly vine to add the final touch. And voila! 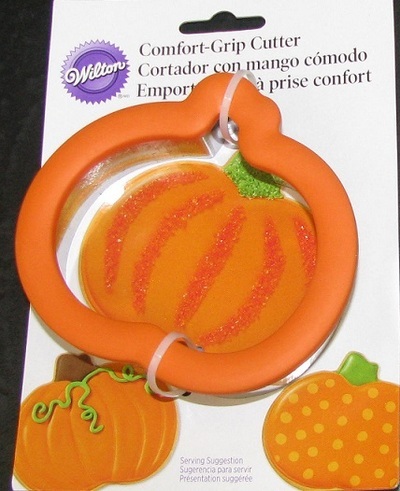 You have now made your very own fancy pumpkin cookie! Allow cookies to dry completely overnight before serving. light on. The light will generate enough heat to speed drying time! Or place them on your counter and have a fan blowing on them - this will also speed up drying time. Both of these methods are not fool-proof and may affect the appearance of your royal icing. It is always best to let the cookies dry overnight, but these quick-dry methods work great if you're in a pinch!